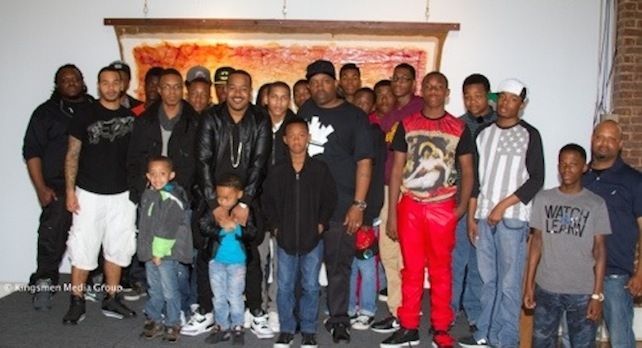 (Atlanta, GA) Epic Records Vice President of A&R/Raydar Family CEO, Ray Daniels and Award-winning Teen Author Stone Erickson mentored young boys at Kingsmen Teen Talk on Saturday March 15, 2014 in Atlanta, GA. The event created by Kingsmen Media Group invited Ray Daniels and Stone Erickson to speak candidly about the challenges young men face to accomplish their dreams especially in the African-American community. Music mogul Ray Daniels inspired the young men with his story on the road to living his dream despite growing up poor without a father. He discouraged them from using their circumstances as an excuse not to be great men. “I decided to never be a victim. I own my failures and I own my success,” said Ray Daniels. “Because I didn’t come from anything people didn’t expect me to amount to anything so I started working as if Bill Cosby was my father. People expect Bill Cosby’s son to be great.” Daniel also gave the young boys an impromptu lesson on manhood telling them to speak up, raise their hand proudly and look another man in his eyes when he speaking to you. The young men in attendance at Kingsmen Teen Talk applauded and graciously thanked Ray Daniels and Stone Erickson for their inspiration. The mentees received prizes including singed copies of Stone Erickson’s “Black Angel”, a handheld Wii, and hats. They also enjoyed a free lunch and snacks provided by Kingsmen Media Group. Watch a snippet of Kingsmen Teen Talk with Ray Daniels and Stone Erickson here. For interviews with Ray Daniels or Stone Erickson please contact Enchanted Branding & Public Relations, Christal Jordan at christal@enchantedpr.net.